. . . water in my hands becomes a reverence in the rain. At the Art Institute, I have listened to the outside rain. Inside, I see Caillebotte’s Paris street in the rain. with so many trees, made it hard to get wet in the rain. On Devon Avenue, I have pretended to be in Kashmir. But how can I forget the smells and rhythms of Chicago rain? Why is it such an affair to kiss under an umbrella in her rain? Chicago is an ocean—every neighborhood a different port. One knows the same songs she whispers bathing in the rain. In Andersonville, outside a Swedish diner, I take a break from my ghazal. What is my obsession with smoking in the rain? David, I say to myself, while exhaling, What’s next? The passing Clark Street bus splashes, like a ship leaving in the rain. 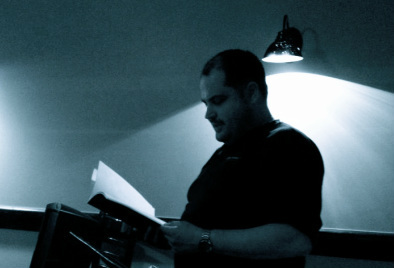 NOTE FROM THE AUTHOR: Fellow poet Shadab Zeest Hashmi taught me that the ghazal form is about “The Beloved,” which for me is Chicago. I write a lot about my hometown, in the face of gentrification, because of my need to document the melting pot I know before it becomes milk toast. 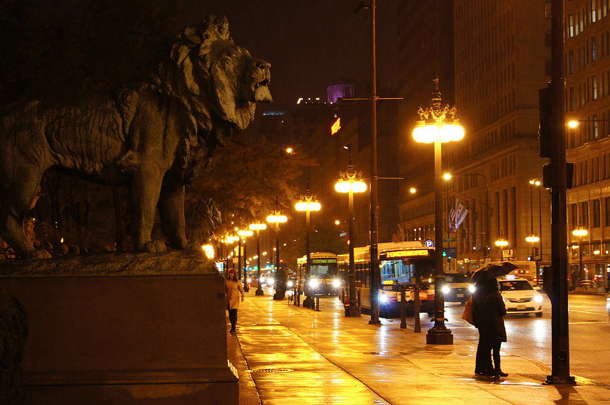 IMAGE: “Lionsgate” (outside The Art Institute of Chicago, 111 S. Michigan Avenue) by Gregory Lafferty. Prints available at fineartamerica.com. David Mathews earned his MA in Writing and Publishing at DePaul University, where he studied under Richard Jones. Recently, his work has appeared in Eclectica Magazine, After Hours, Midwestern Gothic, CHEAP POP, OMNI Reboot, One Sentence Poems, and Word Riot. A lifelong Chicagoan, he teaches at Wright College and College of Lake County.